It was a very nice evening of food, wine, and friends. 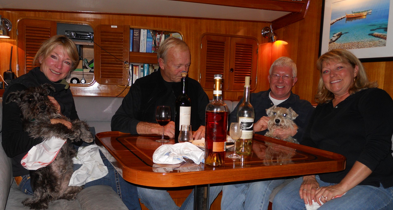 The evening started with lots of yelping from the dogs as friends entered the boat. They quickly settled into their normal routines. Cinco has never met a hand that couldn’t do better by rubbing him. Jupiter is shy but loves to be snuggled up next to someone - no begging for pets, just close snuggles against a thigh or a head resting across a leg. Dinner was great, we had oyster soup followed by shrimp and pasta. Final sweets were chocolates.